Eric's butterfly garlic coho — Schoolhouse Fish Co.
Butterfly fillets help with even cooking and flavor absorption. Eric and I have been giddy to see our first shipments of summer coho arrive this month around the Northwest and beyond. We can only imagine how cool it must be to open up a big box brimming with red-pink wild Alaska on a summer street in St. Louis! Now that your freezers are stocked, your mouths are watering and friends are headed over to help you enjoy your haul, we thought we'd share one of our favorite ways to prepare coho. One of the things I love about Eric is how quickly and brilliantly he cooks his fish. I often miss the process because it's over in a few decisive flashes of the knife, but when I do stand witness, I am awed by the sheer economy of motion, grace of handling, and reverence for the fish embodied in his preparations. Eric loves to "butterfly" his salmon fillets, and since he's out on the boat this week, I'm sharing my humble emulation of his technique, and an old standby recipe that never disappoints. Step one: Lay your fillet horizontally, skin side down, and slice it into 1.5-2" strips. Step 2: Carefully begin slicing the portions lengthwise down the center, but stop when you reach the skin so that the two halves are still joined by the silver skin below. Step 3: Here's the fun part. Pick up the portion and with a hand on each half, gently open it like a book and fold it outward like butterfly wings. 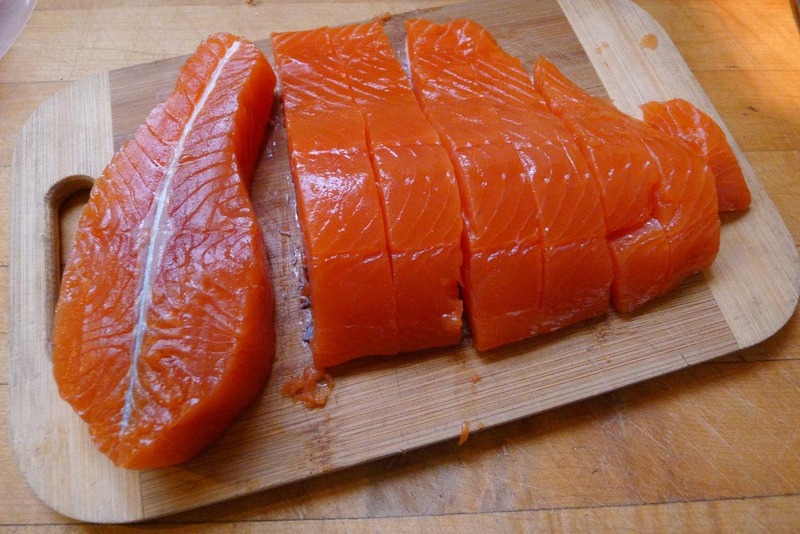 You now have a salmon steak with uniform thickness, which means you'll have better success cooking it evenly. We do this to avoid the pattern of overcooking the thick and undercooking the thin portion of a typical side of fish. Step 4: Lay your gorgeous fillets in a baking pan and admire nature's patterns on display by cross section. These are the forms that have allowed her to propel herself through the wild Pacific Ocean in preparation for the big swim upstream to lay her eggs in a gravel nest and spawn. By exposing the interstitial spaces between these powerful bands of muscle, you've also created space for your dressings to soak in as the fillets cook! Step 5: We like generous pats of organic butter from pasture-fed cows, local organic garlic (this time from Orsi Organic Farm in Juneau), sea salt (try handmade spruce tip sea salt from Sitka's Alaska Pure), and fresh-ground pepper. Step 6: Bake at about 350 degrees for less time than you think you should! Around ten minutes or so should do the trick, depending on your oven and thickness of the fillets. Remember the fish will continue to cook in the butter after you remove it from the oven, so serve immediately.